Installing a copper bath sink in your home can enhance the look of your bathroom, giving the room an entirely new and unique feel. Even for the budget-minded person, a single bathroom renovation can be as simple as changing the bath sink. Circle City Copperworks copper bath sinks offer an easy way to realize the updates that you are looking for without spending large amounts of money. Our bath sinks come in a wide variety of styles: drop in, under mount and vessel style copper sinks. As with all of our sinks, they come in hammered and smooth copper and you can choose from any of our copper patina's. Copper spun sinks are made with 32 oz. (.0430 thick or 18 gauge) pure American copper and are the only sinks that we hammer by hand. Because of material thickness and fabrication these sinks are a cost effective purchase for any new bathroom or remodel. 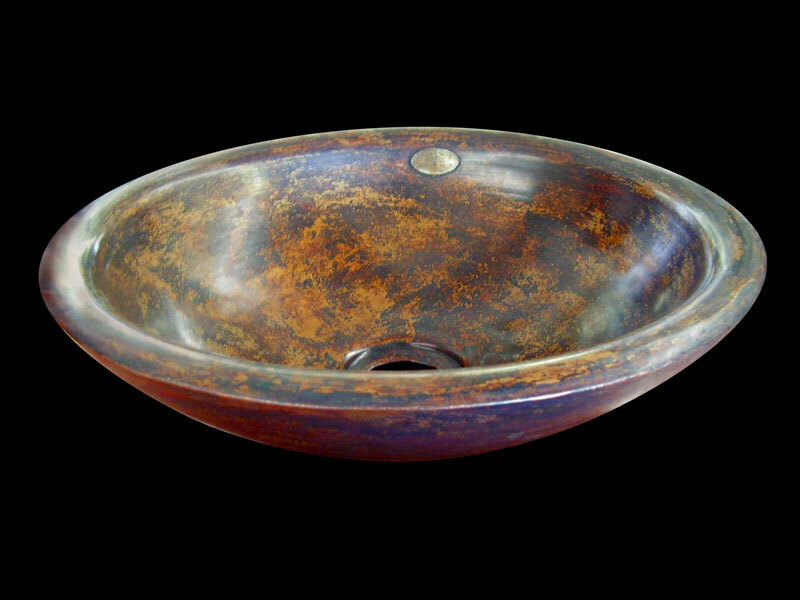 You can choose any of our patina’s for your copper bath sinks. Spun sinks come in drop in or under mount styles. Drop in will have a rounded rim to make room for caulk or silicone. On the under mount style, the rim of the sink is flattened for an easy install underneath your counter top. Copper vessel sinks are a part of a modern design trend. Copper vessel sinks are ideal for bathrooms with traditional décor that need to have a unique centerpiece. Our natural copper vessel sinks provide this focal point. Vessel sinks are bathroom sinks that sit on top of the counter, unlike an under mount or drop in sink. Our copper vessel sinks bring old world charm to your new world bathroom. Our vessel sinks are 2 spun sinks that we weld together and grind the edges smooth. They are made with 48 oz. (.070 thick) pure American copper. We offer copper vessel sinks in hammered by hand or smooth copper, you can even have the inside bowl smooth and the outside hammered or vice versa. In most cases our bathroom sinks come with a standard 2” vanity drain hole. If you use a drain that is not ours we will need to know so we can make the hole for the drain smaller. Our vanity drains are old world in appearance; they have a copper stopper that you put in the drain when you need to plug up the sink. Please see pictures below for a picture of the drain. 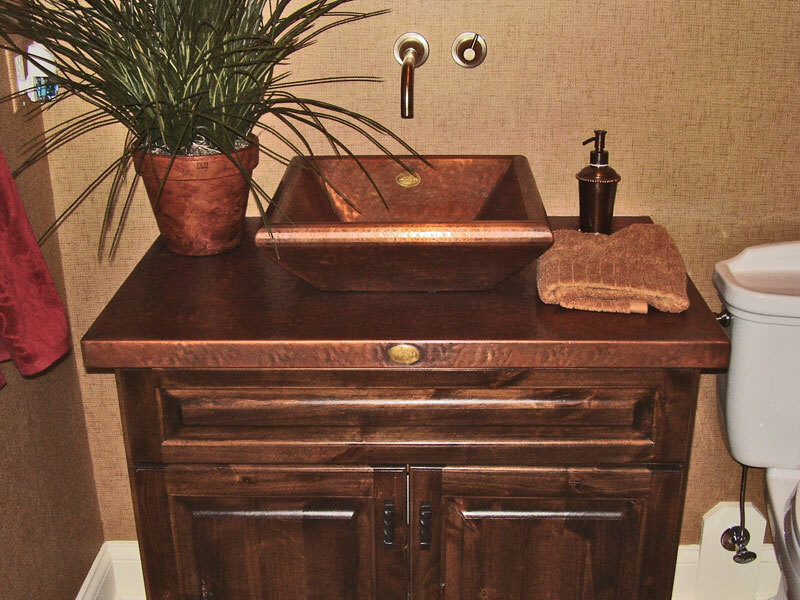 Circle City Copperworks handmade Vanity Copper Sinks feature true craftsmanship, durability and enduring style. Copper is a beautiful and practical medium for your bathroom design. Our custom, to order copper sinks possess an eye catching look which is both stylish and unique. 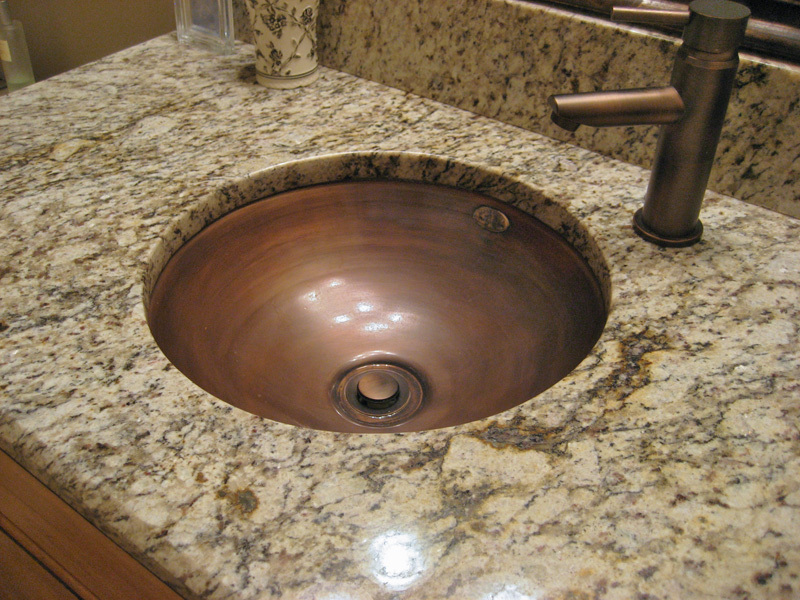 Enhance the beauty of your bathroom with a copper vanity sink from Circle City Copperworks! Please give us a call at 317-284-0687 for any custom ideas you may have, we will be happy to assist you. This is one of two sinks we made for a client who requested a unique design. It is regular hammered with a medium brown patina as the finish. The sink is handmade in the USA from pure 48 oz. American copper. No lead, tin, or arsenic, like you will find in cheaper copper products. Please call Circle City Copperworks at (317) 284-0687 for custom sizing & pricing. This is a hammered finish Copper Square Vessel Sink with a pyramid design and a 1" rounded flange. It is pictured in a Medium Brown patina, along with our hammered countertop it is sitting on. The sink is handmade in the USA from pure 48 oz. American copper. No lead, tin, or arsenic, like you will find in cheaper copper products. Please call Circle City Copperworks at (317) 284-0687 for custom sizing & pricing. This is a Half Moon Shaped Copper Sink for a bathroom vanity for a drop in application. This sink starts at 20 1/4" wide and 13" front to back O.D. and is 7" deep in the center. It is pictured in a Medium Brown patina. The sink is handmade in the USA from pure 48 oz. American copper. No lead, tin, or arsenic contained. Please call Circle City Copperworks at (317) 284-0687 for custom sizing and pricing. This Hammered Copper Spun Sink is 12" inside diameter, undermount style with a 1" outer flange. Other sizes available are 14" and 16" diameter. All of our spun copper sinks are 6" deep and accept a 2" diameter drain or we can make it a standard size to work with your drain. The sink is handmade in the USA from pure 48 oz. American copper. Please call us at (317) 284-0687 for pricing and ordering. 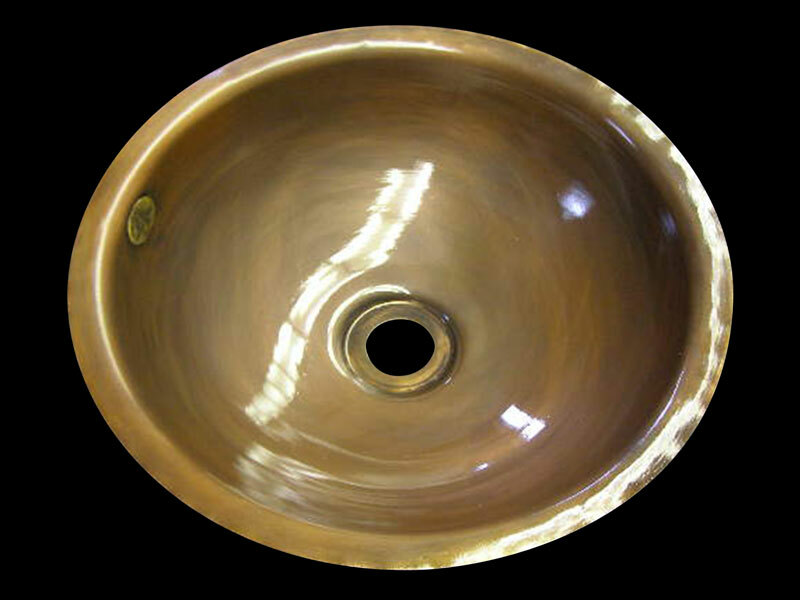 Picture is a smooth finish Copper Spun Sink with 16" inside diameter and a 1" outer flange for undermount installation. It has a Medium Brown patina with our waxed finish. The sink is handmade in the USA from pure 48 oz. American copper. No lead, tin, or arsenic, like you will find in cheaper foreign copper products. Please call Circle City Copperworks at (317) 284-0687 for custom sizing and pricing. This is a 16” Lacquered or clear coated spun sink. It is made out of 48 oz. pure American copper. We can clear coat just about any of our copper products for an extra fee. 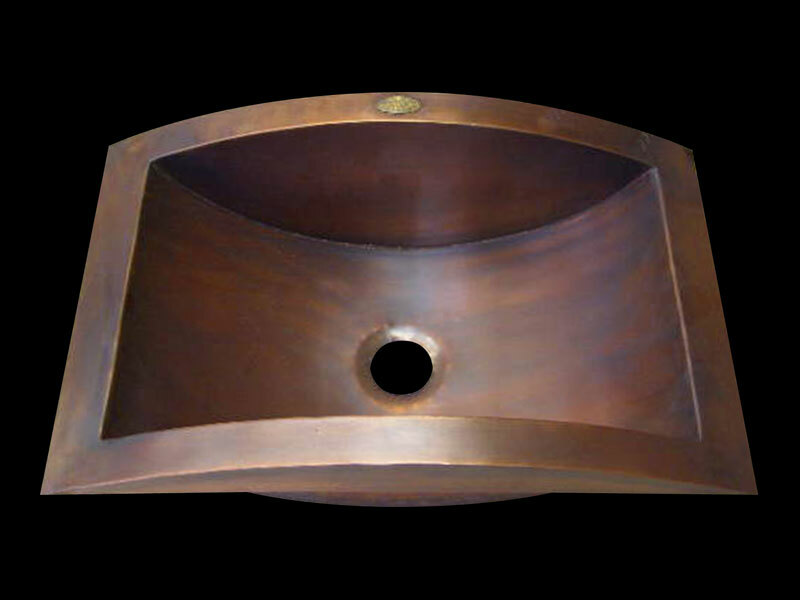 This sink is an under mount style in a Medium Brown patina with our standard 2” drain hole. Please call Circle City Copperworks at (317) 284-0687 for custom sizing and pricing. Shown is a smooth and Mottled patina Copper Vessel Sink with 12" inside diameter and a 1" outer flange. The sink is handmade in the USA from pure 48 oz. American copper. No lead, tin, or arsenic. Please call Circle City Copperworks at (317) 284-0687 for custom sizing and pricing. The shown Copper Spun Sink is 12" inside diameter with a 1" outer flange and done in a smooth Mottled patina. Other sizes available are 14" and 16" diameter. 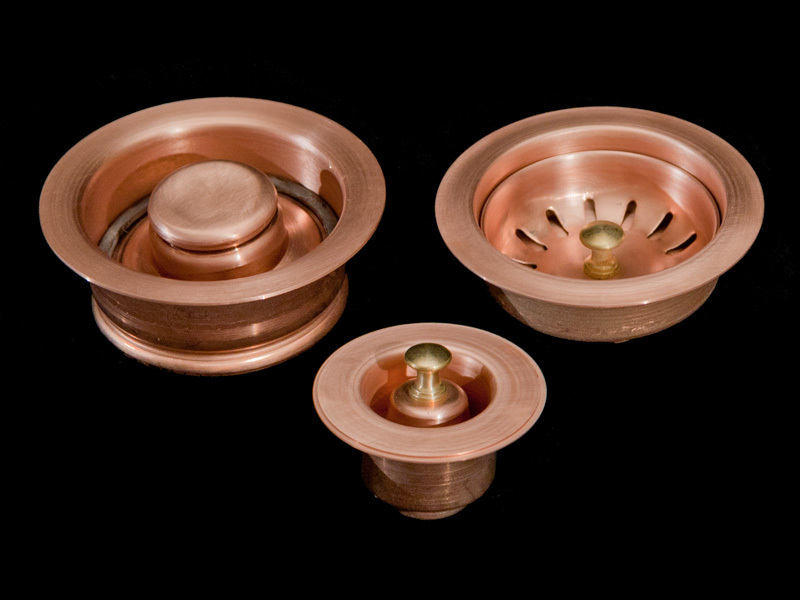 All of our spun copper sinks are 6" deep and accept a 2" diameter drain. The sink is handmade in the USA from pure 48 oz. American copper. Please call Circle City Copperworks at (317) 284-0687 for custom sizing and pricing. Our drains are solid American copper and made by us. We can color these to match whatever patina you choose for your sink. The one on the left is the disposal drain and will fit Insinkerator® type units with 3 3/8" ID as well as most Kenmore® , KitchenAid®, Maytag® , Jenn Aire® , and select models of Whirlpool® . Will not fit Franke® Waste King, or Whirlaway® models. The right drain is our strainer drain, it comes with a PVC bottom for easy installation, these two drains can be used for prep sinks also. The smaller one in the front and middle is our smaller prep or bathroom sink drain for a 2" opening. Price for drains with a sink purchase only is $150. 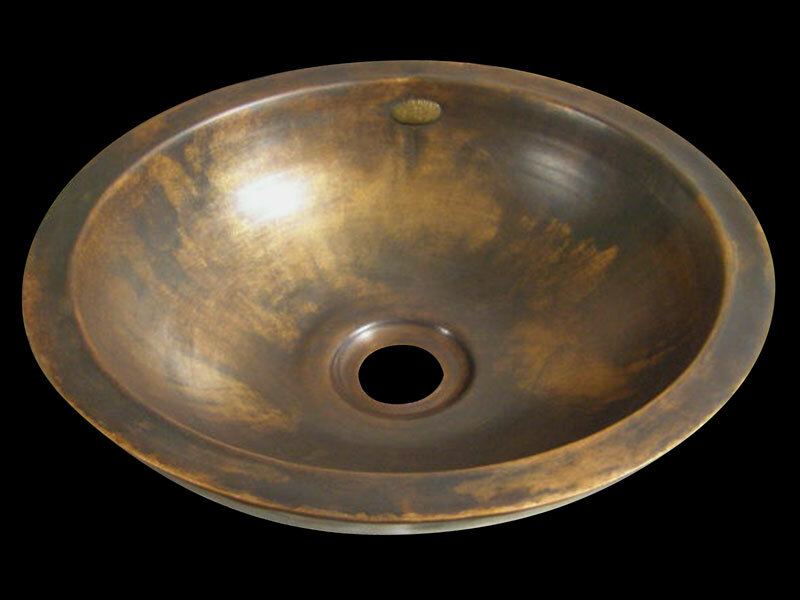 Circle City Copperworks will add a classic look to your bathroom after installing our custom made copper bath sink. Above, you can see from our portfolio, the different types of copper bath sinks, each seen are custom made by the finest standards. More home owners realize that copper bath sinks are both beautiful and functional in any bathroom. New home owners install copper bathroom sinks to accentuate their bath's beauty, to add character to a room by installing a copper item. Copper bath sinks add class to any unique bathroom when you select from our custom and pre-designed copper vanity sink. 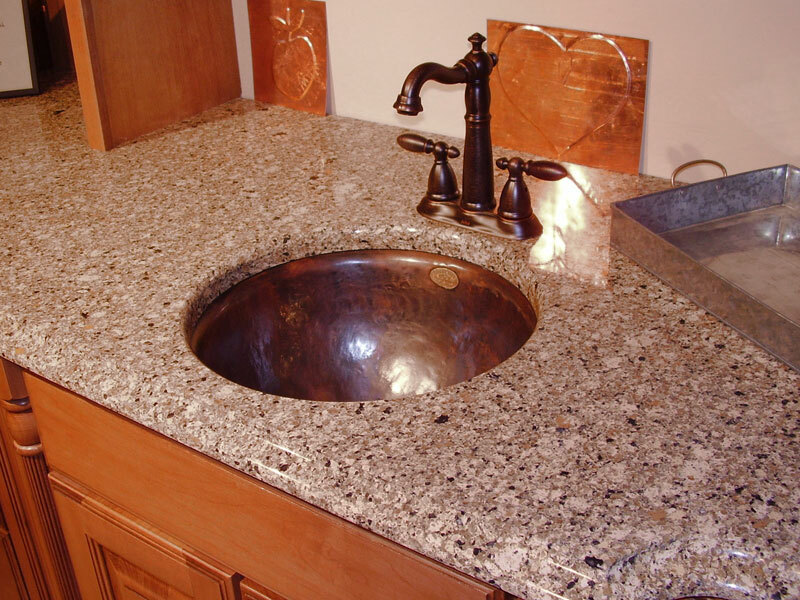 Choose today to remodel your bathroom with one of our copper kitchen sinks!